With the end of the shooting season and the appearance of the early snowdrops, thoughts turn to Spring – and a sigh of relief for many that the winter is almost over. However, the forecast arrival this week of, ‘The Beast from The East’, a prolonged spell of exceptionally hard weather coinciding with the meteorological arrival of Spring, means the hoppers stay full and fairly intense feeding stays in place. The notorious ‘hungry gap’ between the end of the shooting season and the beginning of settled spring weather is one of the most important times for Keepers across the country to continue supplementary feeding to benefit not only gamebirds, but other wild birds too. This supplementary feeding on Edradynate Estate is an important wildlife management tool, undertaken every day by Ian and Ciaran. 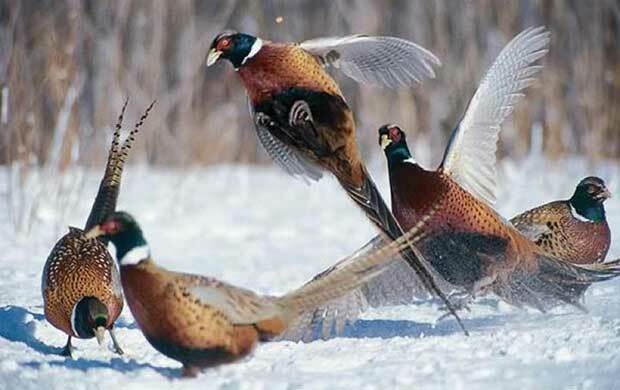 Research by the Game and Wildlife Conservation Trust (GWCT), proves that this practice ensures that game birds are kept in good physical condition, it increases breeding success in pheasants and partridge and it ‘keeps the gamebirds at home’ so they don’t wander in search of food. It has also been proven to improve shooting returns (meaning that the investment in food pays dividends) and also improves the breeding success of songbirds. It doesn’t stop with the provision of good food though! Feeding has to be done in conjunction with effective vermin control. Pigeons, corvids and rodents seek not only to take advantage of the food source but also are predators to nests, eggs and chicks. Here at Edradynate a comprehensive feeding and pest control programme is in place to ensure that the intended species for the food source reap the benefit, supporting what we hope to be a successful wild breeding programme for game and our rich variety of songbirds too.